This was first published in my “Ask Chantal” column of the Autism File. I am currently reading your book Adolescents on the Autism Spectrum,… I have a son who is 27 and throughout his entire life he has been different… Recently I have come to believe he is autistic. My girl friend who has a 13 year old autistic son, says she has always wanted to tell me that she feels the same way in the belief that he is of the autism spectrum, possibly Aspergers. He has almost all the symptoms. I am now in the process of trying to get my son into some doctors in Melbourne, FL who are specialists… He has been a struggle to raise with all of his illnesses and challenges. He has been with disabilities since he was 4. We have been seeing the same psychiatrist for 22 years and were going to the same pediatrician for 17 years. …Why has no doctor been unable to suggest this diagnosis? Help me please. I am very interested in knowing if you have any other books out for adolescents and young adults with autism and/or Aspergers? It wasn’t until 1994 that Asperger Syndrome was added to the DSM IV (Diagnostic and Statistical Manual of Mental Disorders) which is used for establishing diagnoses. It is only in recent years that Asperger’s Syndrome (AS) has become more understood and recognized by professionals and parents. That is why many adults with AS were actually misdiagnosed as children, often with bipolar, schizophrenia, OCD, and so on. You are right to look for a specialist experienced with Aspergers to ascertain if your son falls on the spectrum. Being properly diagnosed is useful for knowing why someone is the way he is and what strategies can be helpful in the areas in which he may have challenges. My latest book, Autism Life Skills, based on interviews with adults on the spectrum may be helpful to you and your son to find out what many people on the spectrum say has been helpful to them. As well, you and your son may find GRASP a useful resource for more information. I have spent seven years at Torrey Pines High School. Three years ago, I walked the graduation ceremony. Today I walk the same path, in the same cap and gown, but I have now earned my academic diploma. My education at Torrey Pines has been my greatest achievement. I was once diagnosed autistic and severely retarded. When I arrived at Torrey Pines, I could not communicate and I spent my days in a class for the severely handicapped. Now I am going to college. I am writing a book about my life. 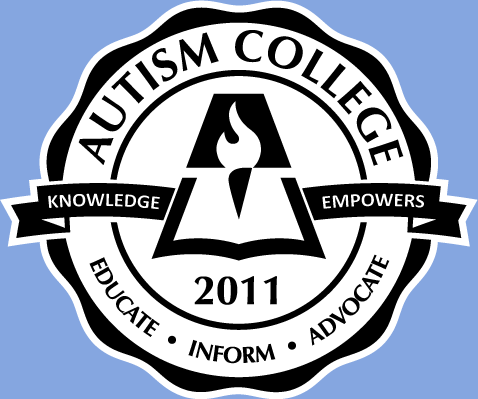 I have become an inspiration nationally to many parents and educators of children with autism. My story is like Helen Keller’s, the deaf, mute, and blind girl. Helen Keller had a teacher, Anne Sullivan, who taught her and took her out of isolation. My first great teacher was my mom, then the high school teachers. My favorite story about Torrey Pines is when my teacher, Allan Gustafson, realized for the very first time that I understood everything. He was really trying to learn how to communicate with me. He said “Jeremy, I know you are in there somewhere. I can’t know what you are capable of unless you tell me.” I looked at him and saw tears in his eyes. I really wanted to make him happy. My nice teacher continued to try and reach me. He said, “Give me a sign.” I looked at him and spelled with him for the first time. Great teacher Allan was so happy. The teachers here gave me good advice on more than just the subjects they taught. They understood that I might be different on the outside, but that on the inside I was just like any other student. Other important people include the ladies in the administration building who always said “hi” to me, and told me they were happy to see me. My speech teacher, Dr. Palmer, was nice, even if she tried to convince me to become a Republican. An exciting memory from this campus is when an MTV camera crew followed me around campus for the show, True Life: “I Have Autism”. I would like to thank Bruce Cochrane, Director of Pupil Services, for the chance he took and the faith he had in me. I would like to thank the administrators, the school staff, the educators, (including Maureen and Janine), for allowing my voice to be heard. Without you, my life would still be imprisoned in darkness. Nicely I wish I had made more friends from my years here. Being autistic, that is the hardest part. It is important to include all students in general education classes so they can be with their peers. When Helen Keller grew up, she graduated from college, became an author, and an advocate for people with disabilities. I hope to do the same. Teachers, never underestimate your students no matter how disabled they may appear or what difficulties they face. Parents, believe in your children and encourage them to fulfill their dreams. Students, give yourself the power to hear the voice inside telling you that you can create the life you dream of. Believe in yourself, and never allow anyone to discourage you. Autism can create stress in couples, what to do? Parents all over the world feel the stress of having a child with autism. This letter is from a parent in the UK and was first published in The Autism File. My husband and I are near a divorce, the pressure is immense with our autistic son who is 4 years old. My husband blames me and I blame him, all our arguments I know are from stress, then we drink to numb the pain of helplessness. We need help and I don’t know where to turn to. I need to talk to someone and I am desperate for my husband to love me again. Autism has simply wrecked our lives, I love my son but I feel I have lost my life and husband now. Please help. My heart goes out to you. You are not alone in your situation, unfortunately many marriages become very stressed when trying to deal with having a child with autism. It sounds as if you and your husband need some time away together from your child, time to enjoy each other’s company, to rediscover what you enjoyed about each other before autism entered your life. Try to find someone to watch your son on a regular basis (ie once or twice a week) so you and your husband can leave the home and have a date. Individual counseling for you to have someone to speak to, and couples counseling may help you learn how to deal with the new family dynamics. Finding the right therapist is important. Perhaps contacting your local autism society chapter and finding out if there are any recommendations from other parents. Finally, joining an autism support group could help you feel you are not so alone and you may find other moms you enjoy connecting with. As well, there are many on-line social communities available to connect with to share information and vent. There are more and more dad support groups as well. My best wishes in re-connecting with your husband, and finding the support you need.